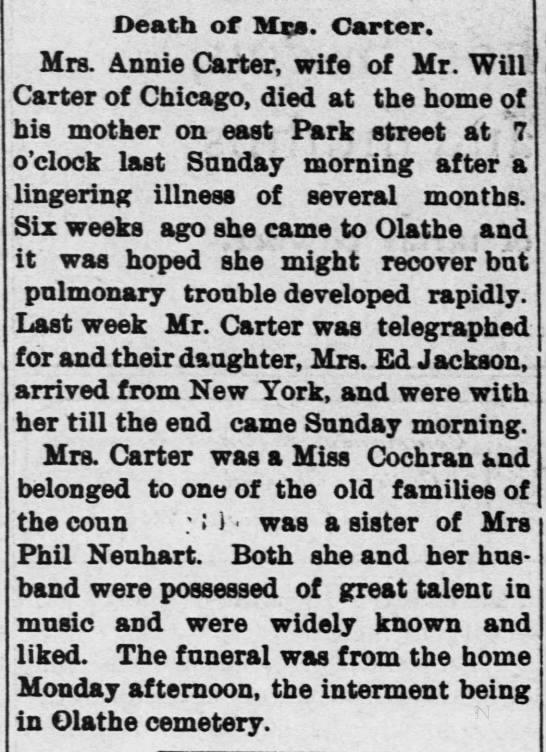 Mrs. Annie Carter, wife of Will Carter of Chicago, died at the home of her mother on east Park at 7pm last Sunday morning after several months of being ill. Six weeks ago she came to Olathe hoping to recover but pulmonary trouble developed. Last week Mr. Carter telegraphed for their daughter, Mrs. Ed Jackson to come from New York. Mrs. Carter was a Miss Cochran and belonged to one of the oldest families of Johnsons County. She was the sister of Mrs. Phil Neubert. The funeral was from the home Monday afternoon with burial in the Olathe Cemetery. Johnson County Births, Deaths and Marriages 1902. Mrs. Annie Carter, wife of Mr. Will Carter of Chicago, died at the home of his mother on east Park street at 7 o'clock last Sunday morning after a lingering illness of several months. Six weeks ago she came to Olathe and it was hoped she might recover but pulmonary trouble developed rapidly. Last week Mr. Carter was telegraphed for and their daughter, Mrs. Ed Jackson, arrived from New York, and were with her till the end came Sunday morning. Mrs. Carter was a Miss Cochran and belonged to one of the old families of the country, was a sister of Mrs Phil Neuhart. Both she and her husband were possessed of great talent in music and were widely known and liked. The funeral was from the home Monday afternoon, the interment being in Olathe cemetery. Mrs. Annie Carter, wife of Will Carter of Chicago, died at the home of her mother on east Park at 7pm last Sunday morning after several months of being ill. Six weeks ago she came to Olathe hoping to recover but pulmonary trouble developed. Last week Mr. Carter telegraphed for their daughter, Mrs. Ed Jackson to come from New York. Mrs. Carter was a Miss Cochran and belonged to one of the oldest families of Johnsons County. 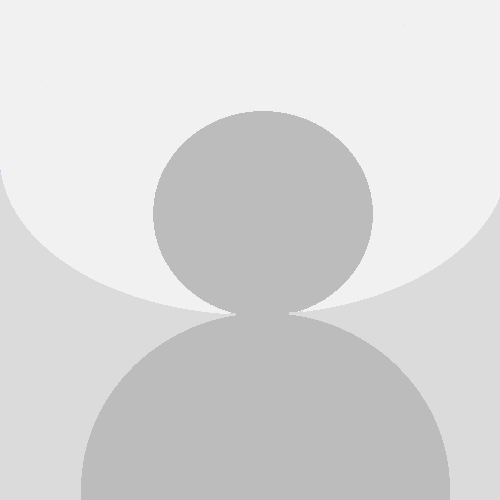 She was the sister of Mrs. Phil Neubert. The funeral was from the home Monday afternoon with burial in the Olathe Cemetery. Johnson County Births, Deaths and Marriages 1902. Please share your memories of Annie.